I-Care Family Vision & Eyecare LTD provides comprehensive eye exams combining the latest technology & attentive, personal care. 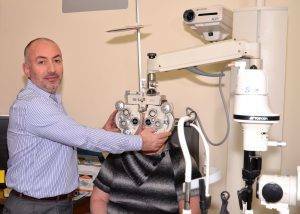 Dr. Kattan’s expertise and professionalism have helped him become an established optometrist at Stony Plain, AB. Family Eye Exams in Stony Plain, AB are near you! We offer a complete spectrum of eye care services to clients of all ages, from children to adults including routine exams, corrective laser eye surgery, urgent eye care or eye emergencies, specialty contact lens fittings, and co-management of ocular diseases. The eye care professionals at I-Care Family Vision & Eyecare LTD caters to a diverse clientele to support a wide array of eye conditions, such as macular degeneration, dry eye, diabetic retinopathy, glaucoma, and cataracts. Dr. Kattan can help with problems that can be spotted with an eye exam, what’s involved in a comprehensive exam, and special considerations for kids and contacts. According to experts, 80% of learning is visual, which means that if your child is having difficulty seeing clearly, his or her learning can be affected. This also goes for infants who develop and learn about the world around them through their sense of sight. To ensure that your children have the visual resources they need to grow and develop normally, Dr. Kattan can check their eyes and vision at certain stages of their development. A routine exam at I-Care Family Vision & Eyecare won’t provide some of the measurements and testing that are required to determine if your eyes are suitable for contact lens wear, and to generate your contact lens Rx. Even if your child has “20/20” eyesight he may be experiencing vision problems. Call Dr. Kattan in Spruce Grove, AB to book your appointment today! At I-Care Family Vision & Eyecare our expert eye doctor helps manage ocular diseases including Glaucoma, Macular Degeneration, and Cataracts. In our Spruce Grove, AB office we use the most up-to-date technology to ensure the best eye care possible. Learn about the different types of tests and equipment you may experience on a visit to I-Care Family Vision & Eyecare. Dr. Kattan offers emergency services that require immediate and urgent eye care. Did you know Dr. Kattan can help you with red eyes, pink eye, or sore eyes, foreign body removal and eye emergencies? Low vision is the term used to describe reduced eyesight that cannot be fully corrected with eyeglasses, contact lenses or eye surgery. The primary causes of low vision are eye diseases, but low vision also can be inherited or caused by an eye or brain injury. Call our Spruce Grove, AB office to learn more about low vision. Astigmatism is a very common eye condition that's easily corrected by eyeglasses or contact lenses and on some occasions, surgery. For those of you suffering from astigmatism, call Dr. Abdo Kattan in Stony Plain, AB. After age 40, it is common to start to experience difficulty with reading and performing other tasks that require near vision. This is because with age, the lens of our eye becomes increasingly inflexible, making it harder to focus on close objects. This condition is called presbyopia and eventually it happens to everyone who reaches old age to some extent. I-Care Family Vision & Eyecare can help with presbyopia! Dry eye syndrome (DES) is a chronic condition that develops when your eyes do not produce and maintain enough tears to keep the eye’s surface lubricated. Call Dr. Kattan for your dry eye appointment.